Our first apples are growing! It’s almost 2 months since the big planting party, when 20 of us put 300 apple trees in the new orchard. In the month that followed, we more than doubled that number. There are still trees and shrubs in buckets on the porch that we may or may not get around to planting. Truthfully, I have about reached my limit on what I can take care of in a day . First priority are the 57 chickens, 8 geese, 3 bitchy goats and 1 cat who has decided that his proper nature is a farm cat but knows nothing about raccoons, dogs or skunks. Keeping him from skunks is particularly worrisome. Second priority is watering the new trees. Third and far down the probability of completion on any given day are luxuries like showers, doing dishes and weeding the garden. We are going to have a great crop of volunteer sunflowers instead of corn unless I spend some time with my hoe very soon. If you are an apple tree, your chances around here are excellent. 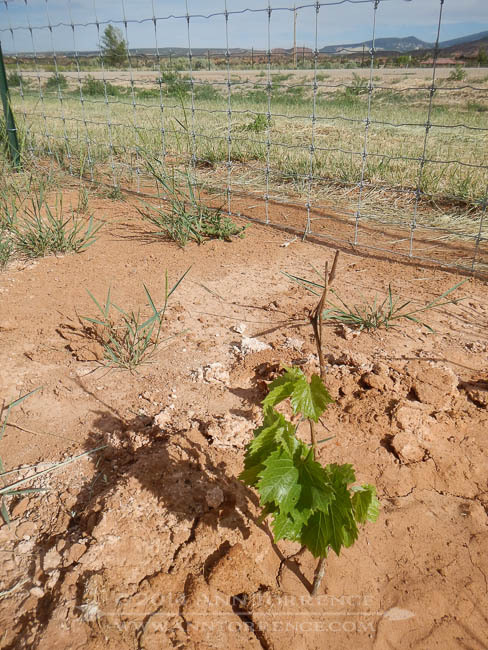 I believe we haven’t lost more than 3, which I consider excellent results for whips (unbranched saplings) only one year from being grafted. Most of the other fruit trees are doing well, although a few of the pears still haven’t broken bud yet, not sure if they will. 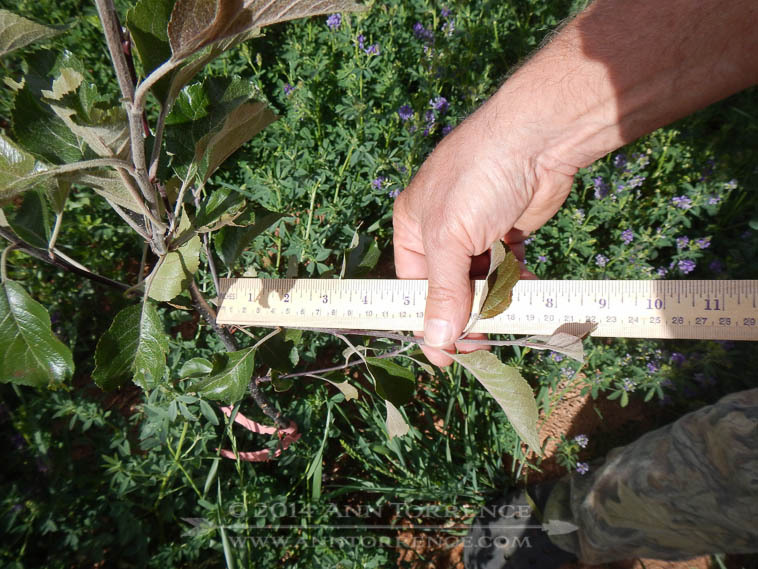 The apples are showing the kind of growth we expect at this point, at least 4″ on every tree and some are more than double that. Redfield seems to be particularly vigorous for us again (we planted some last year as well with similar results). The fedge is struggling along. With my attention going mostly to the apples, the windbreak receives what Mark Shepard refers to as the STUN method of care: Sheer, Total, Utter Neglect. Actually, not completely, but it hasn’t gotten watered as frequently as it would like and our losses are commensurately higher. I can tell you that the Staghorn Sumac is doing the best, and a few of the pinons have more than an inch of growth. But I doubt we will get 50% of the hedge through summer. There’s no sense in coddling along windbreak that isn’t ever going to get a whole lot of attention, and the plants themselves weren’t too expensive, so it’s the right place to cut corners. The strawberries, thanks to the geese, may be a complete loss. Or it could be too hot where I put them. Or they could still be settling in, but I suspect the geese even so. Geese, I can report, also like the new leaves of currants and gooseberries. And corn. And lettuce and sunflowers. Ravenous monsters. Fencing has been reinforced. 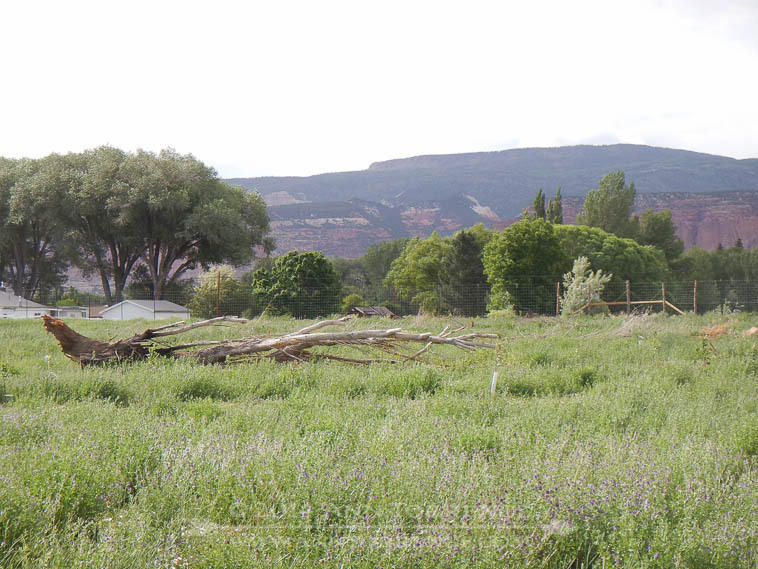 The new trees are there, among the nitrogen fixing alfalfa and a dead tree that the town kindly donated to our organic materials collection project. At some point it will get chunked up and moved to a more suitable location. My mistake for not giving better directions on where to put it. The Siberian pea shrubs fall in the category of serious type 1 error. The idea was to plant them WITH every other apple tree and see if the pea shrub’s nitrogen fixing gave any advantage to the apple. Alas, I didn’t schedule the pea shrubs to arrive in time for planting day. So R and I dug a second hole alongside over 100 apple trees and shoved a pea in it. Later, whenever we planted the other fruit trees, we put in a Siberian pea in the same hole. They all got planted, but my grand experimental design: FAIL. As could be predicted, the back-filled pea shrubs are struggling, our losses will be high. But enough are doing ok that we will have a source for propagation for as long as we need them, maybe forever whether we want them or not. We have so much alfalfa out there I shouldn’t worry about nitrogen anyway, but the pea has other useful attributes, like yellow flowers for pollinators and dropping loads of organic material in the fall. Some sources even say that chickens will eat the seeds, although others disagree. The chickens will let us know what they think about them in a couple years. 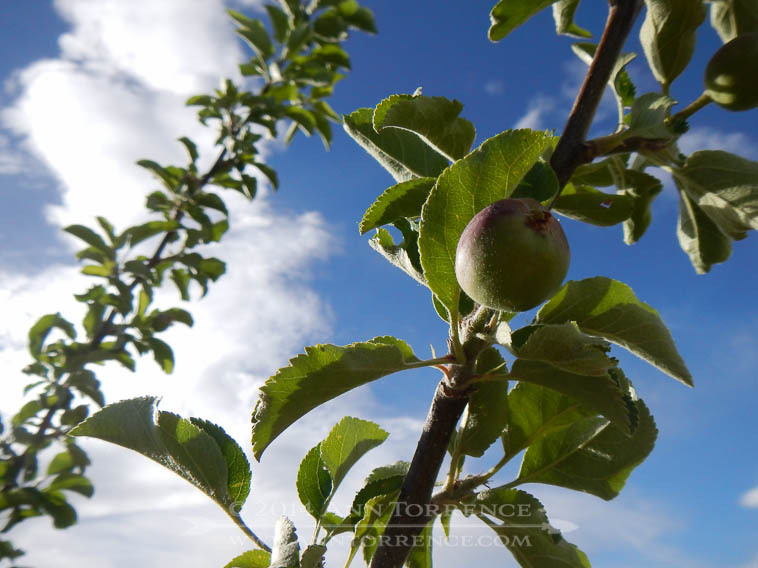 The biggest news of all is that, despite the 20° freeze that came right after planting day, we have our first apples on the trees we planted in 2012 and 2013! Ok, maybe it’s only a dozen, but them there are our apples. They are about the size of a large grape. R wants to bag them like Japanese farmers do to keep out the pests. Why not? If all goes well, we might even have our own apples at the third annual Apple Tasting party in October. There is so much life out in the orchards now: more weeds than I’d like, and a rabbit that needs to find another home. The bees are starting to show up, and perching birds are finding some of the bigger trees. It’s only going to get better. More diverse, more habitats, more yields. Right now, the odds are looking pretty good. I now understand the meaning of “mad as a wet hen” because I’ve got eight of them out in the orchard. 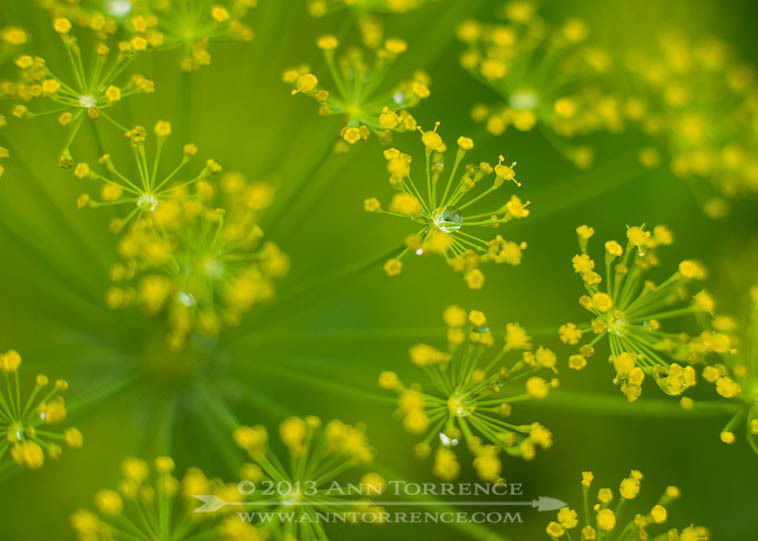 I emptied the rain gauge–again–this time over 3″ in the past few days. Nearly 6″ in total since the deluge started, about the time we started working on the hoophouse. The hoophouse, which in my grand scheme, was supposed to be planted out last weekend, still doesn’t have a cover on it. Maybe Saturday, and then there are still doors to be built, soil to be worked, seeds to be planted. We are running out of time and that makes me mad as a wet hen. I can do no more about it than the hens can make it stop raining. The hoophouse will be integral to the homesteading program around here. It’s 20’x48′, big enough to grow our winter veg, house the chickens in the winter and substitute as the barn/shed we desperately need. It will also serve as a relief valve for cats and humans to get out of the house during wintry inclement weather. This is a DIY project, starting with a kit from Growers’ Supply. R and I can hardly believe we can actually do this ourselves, but it is happening, slowly. As we work on it, I am making a time-lapse of the process; when it’s done I’ll throw it up on Youtube. The “must-be-done-before-freeze-up” projects inch along. The red enamel wood stove is sitting in Cedar City, waiting for us to call and say the fire-proof backing is done so the stove can be installed. Tomatoes are slowly making their way into jars of pizza sauce. The Painted Mountain corn is trying to dry out. The old fence surrounding the new orchard is being demolished by Scott C and his tractor, new materials gathered, but the crew isn’t available to build the thing until the restaurants close in the fall. That’s ok, we need to amass the cash to pay for it. But digging postholes is something you want to do BEFORE the ground freezes. I keep telling R that we get through this last bit of infrastructure and we can rest easy until spring. Then all hell breaks loose when we plant the new orchard, but I’m not thinking about that yet. We did get one project done. R installed a storm door last weekend when lightning ended the hoophouse work. No one around here is standing on a scaffolding in lightning, no way. We have wanted a storm door with screens for summer for a long time, and finally got around to it. It’s simple things like that you don’t realize will have such a big payoff. No flies! More daylight inside! No cats clawing at screens! Best of all, it thwarts the tendency of members of the household to wander off unsupervised when the front door is open. I don’t really like holding them hostage, but until Mango and Slate show they are smart enough to evade a skunk, they are on a dog-harness restraint order unless in a fenced area. Giving Slate a skunk bath, now that sounds like an incident guaranteed to turn me into a mad red hen! Still here, dodging raindrops for the foreseeable future. The weather forecast suggests I might consider building an ark as my next project. And I thought we moved to a desert. P.S. If you are around Saturday morning, we are going to attempt to pull the main cover over the hoophouse. If the wind isn’t blowing too hard, that is. Rain is no problem, but a 40’x50′ plastic sheet-turned-into-sail would be awful hard to install. I’ll throw up a plea for help on Facebook, but basically what we need are enough humans to hold the film in place while we quickly clamp it down. No strength moves required, just body weight. With any luck, we could get it done in 30 action-packed minutes of adventure all recorded in a time-lapse movie! Then it can rain and snow all it wants. Mango tries out the hammock. It was her idea. Someday I will have a new IPhone with a better camera. R is coming home today. In his car, he is bringing: his guitar, some laundry, supplies to build a home cheese press, a 90-year old neighbor, a dozen ears of corn, and a little blue cooler with two gallons of raw milk that will be purchased enroute. When we sold the Salt Lake house, we had a fuzzy vision that I would split my time in the city and the ranch. Things did not turn out that way. We had a hard time finding anyone reliable to do our irrigation turns. Then we decided to plant apples. That quickly got out of hand. The cats really resented commuting. And I don’t miss the city the way I expected. So I am here nearly full-time. And R still has his lab, a dozen students and staff, three federal grants and a guitar teacher that has transformed his playing. And he has 200 fruit trees, eight chickens and three goats (yes, we are going to get a wether too) on order. Keeping this circus act juggling up in the air AND entertaining has taken some practice and some new tools. Put it on the calendar: I became a Mac fan-girl in 1993; R was late to the party but now surpasses me in rabid Team Apple support. With all our gear, phones, tablets, computers, we still sit down every few weeks and put our schedule (mine, his and the irrigation turns) onto an old-school, color-coded calendar. Writing it out together helps id the days we to find a cat and chicken-sitter, how many joint projects we can accomplish, and generally helps avert crises-in-the-offing. So far we haven’t committed the sin of missing an irrigation. In our unending campaign to de-Clampett-ize the farmstead, I moved the wood again, photo-documented to prove I really do get stuff done while R toils at the lab. 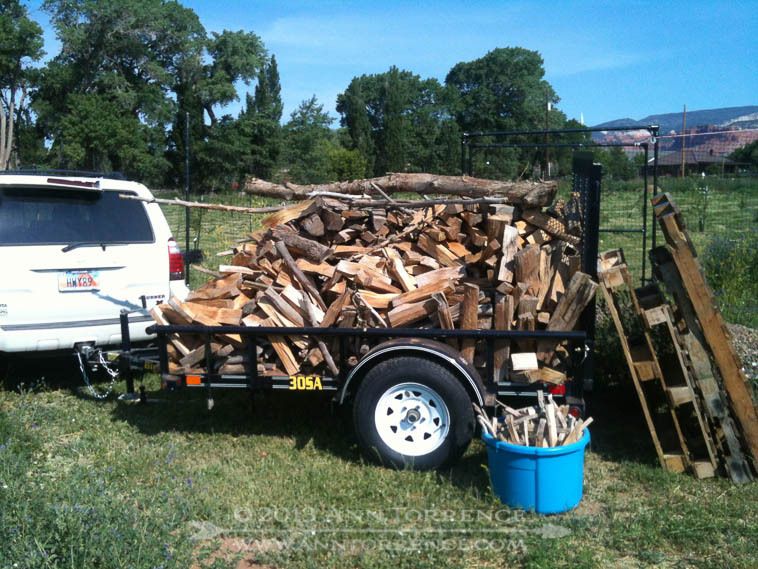 The wood sat in the trailer until he got back and helped me unload; we had to agree on its second-to-final destination; the last being the woodstove I am ordering this week. “Can you put that in Dropbox?” When we were planning the move, I was campaigning for a server. I was predicting dire emergencies where I would need stuff on my desktop machine in Torrey while in Salt Lake. It hasn’t happened, largely because I discovered Dropbox*, a cloud storage service that works beautifully with the Apple products. It appears to act like a regular folder in the OS, but anything I put in it is available on any device. And you can share folders with other users. R and I have a shared folder where we save anything household- or orchard-related. There’s a sub-folder called “Digital Safe Deposit Box” where I have scanned all of our insurance, deeds, financials. Another folder has a scan of my handwritten recipe book. The orchard variety map is in there, PDFs on fruit grafting and pruning, hotel confirmations and extra baby photos of the goats. We can easily and asynchronously transfer huge amounts of data to one another. R has a paid account because he is also using it to manage laboratory data flow. I haven’t needed one yet, but I won’t hesitate to pay when I run out of space. I also use it to back up my Lightroom catalog in my 3-2-1 process, which takes up a lot of my allocation, but so far Dropbox has saved us the expense and the overhead of running a dedicated server. Make an (Ever)note: I have flitted between paper and electronic organizing systems for years and nothing has ever stuck. I’d heard about Evernote when I was looking for GTD tools, but I tried something else that didn’t work and went back to paper. For some reason, I finally looked into Evernote a few months ago. I downloaded a trial and was hooked. My GTD awesomeness factor is still sadly rated as “underperforming,” but Evernote rocks. 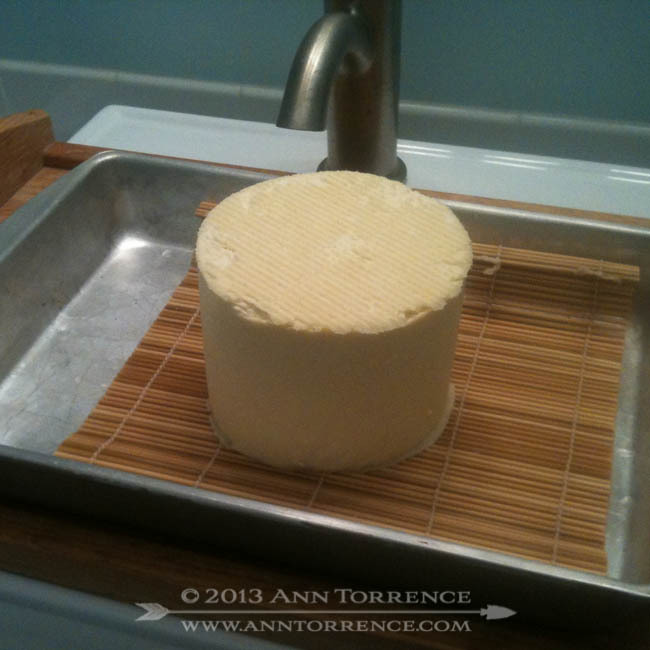 First try at a Farmhouse Cheddar, hence the need for a cheese press. R had to leave before it was time to unmold it, so I sent him another crappy IPhone shot. Like Dropbox, it works seamlessly with all our devices, and like Dropbox, we can share notes and collections (notebooks) of notes. It can save entire webpages, like the instructions for building the cheese press, so when R got to Bigbox orange hardware store, he had the parts list on his phone. A copy of the irrigation schedule resides there, along with measurements for a patio we plan to build, an itinerary for a trip to Colorado next month, and lists of seeds I need to order. 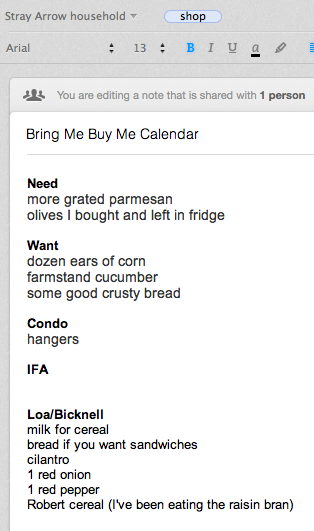 Most frequently updated is the “Bring me/Buy me” list, with its subheadings of things to pick up at the hardware store, the grocery, Tony Caputo’s, Costco, wherever one of us will be passing at some point in the future. We can’t get Mango’s hypo-allergenic catfood at the local grocery. If we go to Richfield (an hour away), we try to run a bunch of errands at once. But mostly it is me asking him to bring me goodies, like good parmesan cheese. I didn’t grow any cukes this year, grocery store cukes are nasty, and I wanted to make pananzella at least once this summer. Last week I canned corn salsa; this week I am freezing corn for winter chowders. We do all the laundry here; the hangers have a way of congregating in Salt Lake. IFA is one of our regional farm stores that happens to carry organic chicken feed in the Sugarhouse branch. If I forget to order it in to our local store, he picks it up there. In the end, it’s just a list of stuff that makes up everyday life, aggregated into one place we both can rely on. And it works. Happiness is contained in a blue cooler: he stops at the Real Food store in Orem for raw milk. Unbelievably, Utah is one of the last bastions of a liberal food policy that allows consumers the choice to buy raw milk. We have been making our own mozzarella for months now, using Ricki’s supplies and instructions. It has become our reconnecting ritual: I make pizza dough while R starts heating the milk. We talk, sip a little wine, eat a hand-crafted meal together the first night he is home. I cook large when he is here: crockpot stews, massive BBQ spreads, casseroles. We invested in a bunch of Ikea food storage containers, into which I portion out single servings and freeze. I try to get ahead, so there are lots of variety to choose from. When R leaves, I pack the cooler with frozen dinners and extra eggs for the lab folks. I start adding to the list again, and won’t cook much until he comes back with the blue cooler. Unnamed Ameraucana's first egg at top. Olive the hen at right, Red's at left. Dumb or Dumber's egg (indistinguishable) at bottom. The AT&T cellular tower is a block away from the ranch: Apparently AT&T rented space in the firehouse tower for its cellular antenna. The signal here is outstanding, whatever its source, much better than at the stinking condo in Salt Lake. We have used our fair share of its bandwidth. Texting is easier during the day with meetings and chores it’s not easy to break away to talk. 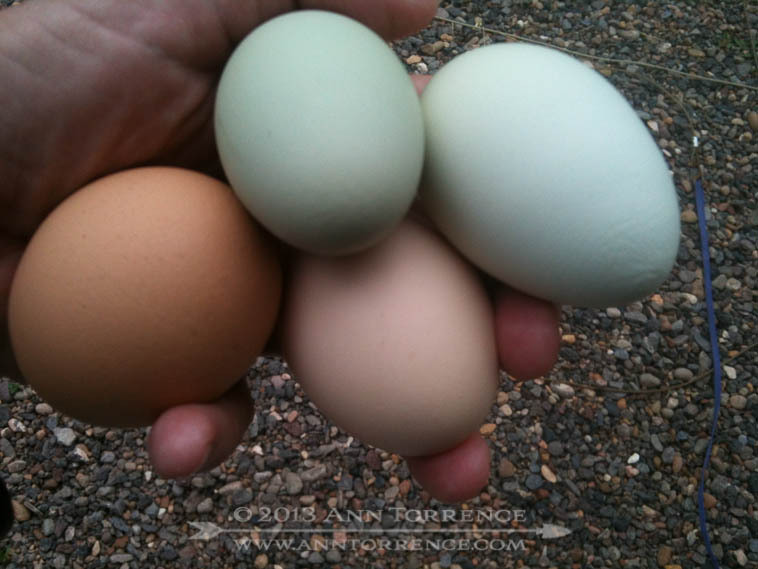 And I can send photos, like the Ameraucana’s first egg (dark green!) 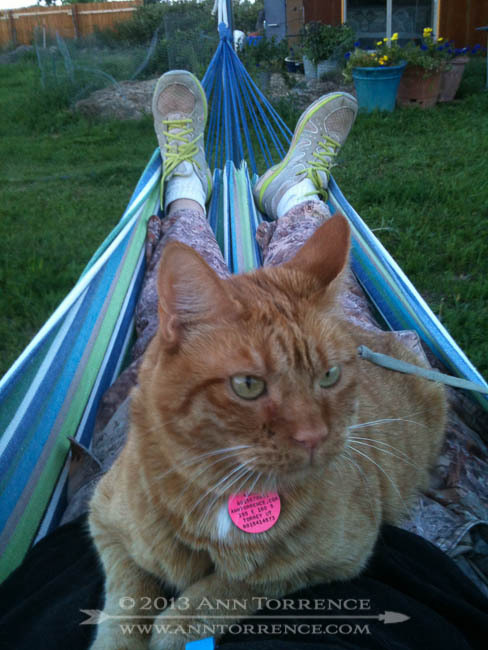 or silly LOL cats (Mango liked the hammock). It’s not the same as being here, but the nightly phone calls and the texts help us stay connected. Tonight we will not have to talk on the phone. We might not make pizza either, because we are branching out into hard cheese and that takes longer, too much to do both in the same weekend. We will husk corn, eat yard food, do laundry, take Slate for a walk in the orchard and enjoy the time together, because early next week, we start all over again. This commuter marriage business is not ideal, but we are lucky to be able to pursue our dreams and goals with mutual support and as much time together as we can steal. We’re using everything we can to make it work. *If you sign up for a free Dropbox account via this referral link, Dropbox will give me an additional 500 MB of much-appreciated storage space.